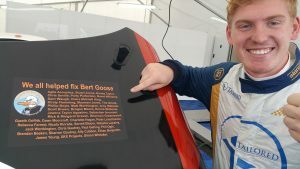 Alex Toth-Jones Racing | You all Helped fix Bert Goose! My car Bert Goose was badly damaged when I was pushed off the track at Spa. Unfortunately we had run out of damages budget so we set up a crowd funding page to get us back on track in time for Knockhill. And we are amazed at the response from our followers! So much so they helped Bert get back on track in time for Knockhill BTCC. Agile Acoustics, Stuart Jones, Emma Taylor, Chris Seville, Party Perfection, David Williams, Sam Waugh, Claire Mitchell King, Kirsty Fleming, Maureen Jones, The Grists, Phil Boyle, Matt Worthington, Amy Webster, Scott Brown, Brogan Moore, Emma Williams, Joanna Taylor Agostino, Sebastian Arenram, Mick & Margaret Craven, Shannon Greenwood, Melanie Stainton, Gareth Griffith, Dawn Moorcroft, Charlotte Hogan, Peter Lenartowicz, Rebecca Forrest, Nicola Kinrade, Sorrell Bloom, Natasha Lapsley, Jack Worthington, Chris Gautrey, Paul Gelling, Phil Ogle, Brendan Beeken, Sharron Gautrey, Ally Cubbon, Ethan Benjamin, James Young, XKX Projects, Simon Whitaker. We couldn’t have done it without you guys you are amazing!